While we are sure that Land Rovers have been put back together in some fairly unusual places over the years, this is probably the first time one has been put together in a menswear department. 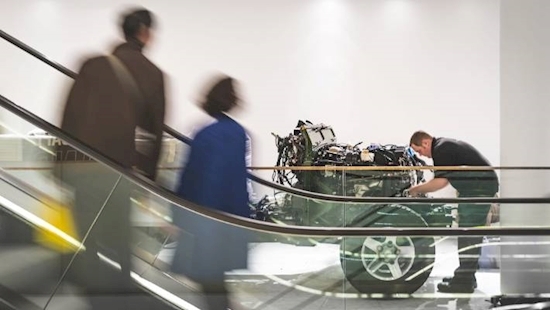 Land Rover has unveiled a unique Defender Works V8 that is now on permanent display in UK high-end department store Selfridges' flagship store in London, after having inserted it in bits through a first-floor window and reassembling it on the menswear floor. 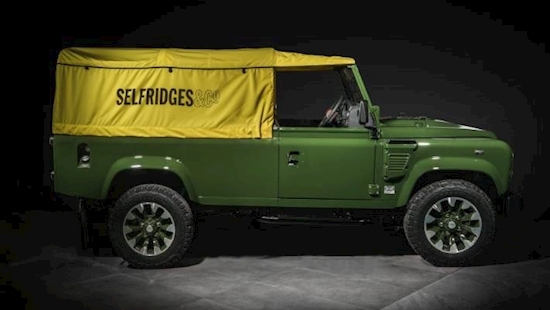 The one-off "Selfridges Edition" is based on the 300kW Defender Works V8 70th Edition and features a number of bespoke elements, including Bronze Green paint, a branded hood in Selfridges yellow, retro-style seats with custom stitching, and unique Selfridges badging. 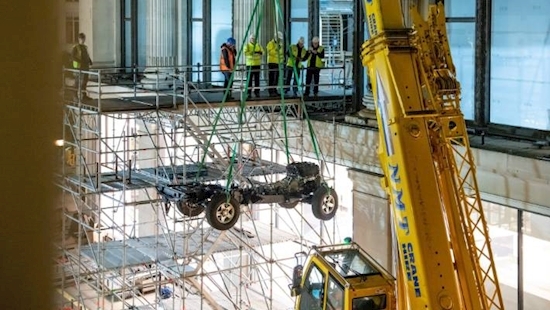 The Defender was craned 11 metres up into the store's first floor as a kit of parts and three specialist Land Rover Classic technicians and five presumably less specialist workers constructed it in full view of the shopping public in just over four days. Land Rover says that more than 930 hours of expert craftsmanship have gone into creating the vehicle, which started life as a 2016 Defender 110 2.2 TDCi Pick Up at Jaguar Land Classic Works in Coventry almost five months ago. "Everything on this car, from the custom cross-stitched leather to the unique Selfridges hood and Works V8 Conversion, has been created at our state-of-the-art Classic Works facility in Coventry," said Jaguar Land Rover Classic Director, Tim Hannig. "This may be the most quickly-assembled one-off Defender in the world, but it will be on display at Selfridges in London long enough for customers to enjoy." Like Land Rover, Selfridges has a rich UK heritage - the famous store was the brainchild of American Harry Gordon Selfridge, who arrived in London in 1906 and opened his first store in 1909 at its current site on Oxford Street. Like Land Rover, Selfridges is celebrating an anniversary soon, although while Land Rover is "only" 70 this year, the department store will celebrate 110 years of trading next year. Part of Land Rover's 70th celebrations included the run of 150 "reborn" Works V8 Defenders (that the Selfridges' vehicle is part of) from Jaguar Land Rover Classic, the company's official source of these reborn classics that rebuilds old Jaguars and Land Rovers to what amounts to essentially brand new specification at a facility in Coventry in the UK, as well as building exclusive "New Original" continuation cars, such as the Jaguar D-type.